The work of Barry and Dogic was selected for exploring a novel pathway for the self-assembly of 2D fluid-like surfaces or monolayer membranes from non-amphiphilic molecules. 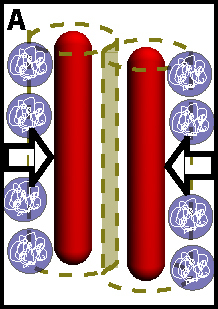 Amphiphilic molecules consist of immiscible components, such as a hydrophobic tail and a hydrophilic head, which are irreversibly linked to each other, thus frustrating their bulk separation. When added to water, these molecules self-assemble into a variety of structures in order to satisfy competing affinities for the solvent. One particular structure, a bilayer membrane, which is a thin flexible sheet with remarkable mechanical and chemical properties, plays an essential role in biology, physics, and material science. Over the past decade the paramount example of conventional amphiphilic self-assembly has inspired the synthesis of numerous amphiphilic-type building blocks for studies of membrane self-assembly including various block-copolymers, heterogeneous nanorods, and hybrid protein-polymer complexes. Underlying all of these studies is the belief that amphiphilic molecules are an essential requirement for membrane assembly. Barry and Dogic, using a combination of theory and experiments, describe for the first time a set of design principles required for the assembly of non-amphiphilic membranes in which the constituent rod-like molecules are chemically homogeneous. Using a simple mixture of filamentous bacteriophages and non-adsorbing polymer, they were able to assemble macroscopic membranes roughly 4-5 orders of magnitude larger than the constituent molecules themselves. Due to unique properties of their system, Barry and Dogic were able to characterize the physical behavior of the resulting non-amphiphilic membranes at all relevant length scales and provide an entropic mechanism that explains their stability. The importance of these results lies in their potential to establish a fundamentally different route toward solution based self-assembly of 2D materials. Papers selected for the Cozzarelli Prize were chosen from more than 3,700 research articles published by PNAS in 2010 and represent the six broadly defined classes under which the National Academy of Sciences is organized. The award was established in 2005 and named the Cozzarelli Prize in 2007 to honor late PNAS Editor-in-Chief Nicholas R. Cozzarelli. The annual award acknowledges recently published papers that reflect scientific excellence and originality. The 2010 awards will be presented at the PNAS Editorial Board Meeting, and awardees are recognized at the awards ceremony, during the National Academy of Sciences Annual Meeting on May 1, 2011, in National Harbor, Maryland. Asst. Professor of Physics Zvonimir Dogic has won a $500,000 award from the National Science Foundation (NSF) Early Career Development Program. The five-year award supports junior faculty who “exemplify the role of teacher-scholars through oustanding research, excellent education, and the integration of education and research within the context of the mission of their organizations,” according to the NSF. Dogic’s research seeks to explain how biopolymers organize themselves into macroscopic materials. A new paper in J. Cell Biology from Bruce Goode’s lab by postdoc Kyoko Okada and co-workers finds that Adenomatous polyposis coli protein nucleates actin assembly. This may suggest a potential role of APC in suppressing tumors through its effects on actin assembly.